The new OMEGA™ mini infrared pyrometer is packed full of exciting new features. Its miniature sensing head measures just 18 x 45 mm (0.71 x 1.8"), making it ideal for mounting in tight spaces. A high ambient version is capable of withstanding temperatures of up to 180°C (356°F) without water or aircooling, allowing significant energy and cost savings to be made. Manufactured from 316 stainless steel and sealed to IP65, the Omega mini sensing head is ideal for food and pharmaceutical applications among many others. A wide selection of optics allows the Omega mini to focus on small or large targets at short or long distances. The special low-noise interconnecting cable is resistant to interference from movement, making the sensing head ideal for mounting on robot arms. It can be supplied in lengths from 1 to 30 m (3.3 x 98'). 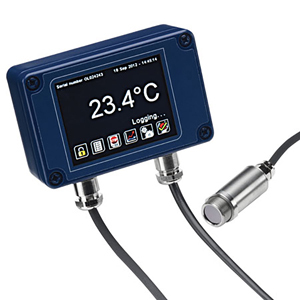 The electronics module is also available with a number of different options: The backlit touch screen interface provides a large, bright display of the measured temperature in digital format and a graph view that shows the history of the measured temperature. It also enables full configuration ofthe sensor including temperature range setting between -20 to 1000°C (-4 to 1832°F), adjustable filtering, peak or valley hold processing, emissivity setting and reflected energy compensation. In alarm conditions, the whole display changes color to provide an immediate and obvious alarm indication. Alarm modes and levels can be configured via the touch screen. When fitted with a MicroSD card, the Omega mini also functions as a data logger, providing a useful means of recording process temperatures for quality assurance and traceability. The user can select the sample rate and the number of samples to be taken and schedule the data logging to start at a certain time. With a 2 GB card, the user can store 28.4 million time and date stamped readings, which provides almost 1 year’s worth of data at the fastest possible sample rate of 1 per second. Output options include 4 to 20 mA, RS485 Modbus and alarm relays, which are rated 24 Vdc so there is no need for a separate trip amplifier. Other options include mounting brackets, an air purge collar, protective lens cover and laser sighting tool. Note: Comes complete with operator’s manual. * To order, specify model number, temperature range, output and interface.